Located in the central region of Alentejo in southern Portugal, it dates as far back as 48BC when it became the region’s capital under Julius Caesar. After the Romans, the town was taken over by the Arabs who occupied it for the next four hundred years. However, its most dramatic invasion was by the French, who stormed the town in 1808 and massacred most of its inhabitants. Beja is an attractive city of white washed houses and red tiled roofs, and the old quarter is an excellent place to begin exploring it as you wander through its narrow streets. One of the most prominent features in town is the Castle which stands on the foundations of an old Roman fort. It was re-built in 1310 by King Dinis to protect the town from attack. The castle keep, Torre de Menagem, stands 36m high and is why it is one of the first things you see as you approach the city. Inside is a steep spiral staircase that leads to the top floor where you will get the best views of the beautiful surrounding countryside. Situated next to the castle is the Se Cathedral. Although it may appear rather sombre looking on the outside, it is extremely opulent inside. Beja has many other fascinating places of worship to visit, the first being St Andrew’s Chapel decorated entirely in 16th century tiles. The original part of the Church of Santo Amaro was built in the 5th century, and houses two exhibits. One is about the Visgoths who settled in this region during that period, and the other displays the area’s history from the Bronze Age to present day. During the 14th century a celebration was initiated in honour of Saint Amaro to ask for the Saint’s protection from diseases of the limbs. Part of the festivities included baking cakes and various desserts in the shape of arms and legs. 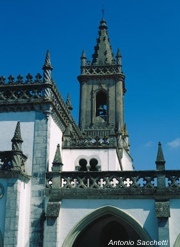 The Museum Rainha Dona Leonor is located in the Convent de Nossa Senhora da Conceicao. There is an interesting story attached to the convent as this was where Sister Mariana Alceforado lived during the 16th century. Apparently Mariana fell in love with a French soldier, and when he returned to France she wrote several love letters to him. Many years later the letters were translated and eventually became internationally famous, known as the ‘Letters of the Portuguese Nun’. Sadly, there is still debate however as to whether the letters are actually fictional. Near the museum is the 7th century St Mary of the Market Church. This church also goes back to the Visgothic period, although most of what you see today was built during the 13th century. The entrance into the church is through an arched 16th century porch, and inside are two bell towers that contain clocks from various periods. Within the Saint Francis Convent is the Chapel of Tombs which was built in a rectangular shape and has a semi circular vault. The Convent is now the Pousada de Beja (Hotel Sao Francisco) offering elegant accommodation that includes a terrace, bar, swimming pool and tennis court. As Pousadas are renowned for their excellent cuisine, the hotel’s restaurant is no exception and specialises in a variety of local and regional dishes. There are many activities nearby that visitors can enjoy while staying in Beja. If you are interested in country pursuits, there is fishing, bird watching, and hikes on the many nature trails. For those who prefer slightly more adventurous activities, there is also horseback riding, hot air ballooning and micro lighting. However, with so many interesting towns in the area, if you choose to take a drive out for the afternoon you will find something special in almost every direction. For instance, only 4km from Beja is Pizoes, which was once a luxurious 1st century Roman Villa. The ruins include some Roman bathhouses and the elaborate system used to heat the pools. The ancient town of Alvito is northwest of Beja and has 12th century caves beneath the Chapel of Sao Sebastiao. To the northeast is Vidigueira, where the family of the famous explorer, Vasco da Gama once lived, and not far from there is another 2nd century Roman ruin in the town of Vila de Frades. This is the only site, in all of the Iberian Peninsula, with two floors remaining. It also has a very early fresco. Heading east in the direction of the Spanish border is the fortified town of Serpa. The 13th Century castle has a long military history dating back to 1000 BC and because of its historical and architectural interest, as well as the town’s fame for making cheese, Serpa attracts many tourists each year. There are several Museums in town, but one particularly interesting one is a private museum devoted to the history of watch making over the last 350 years. With a collection of over 1,600 working pieces from all over the world, you would have to travel to Switzerland to see anything similar. Finally, southeast of Beja is the ancient town of Mertola that once played an important role in the history of the Alentejo region. Well linked to the coast by means of the River Guadiana, it was the route for many trading ships. The importance of trade and copper mining in this area was crucial during the Romans, Visigoth and Moors period, and there are three interesting museums devoted to these different periods of occupation that show evidence of this. You would need at least a week to see everything there is to see in Beja and the surrounding towns. So do make sure you do not rush your stay, and treat yourself at the same time to a very comfortable and relaxing experience by booking into the Pousada de Beja.